Shai Goldstein talks to students during a breakout session after they watched a video of the Rev. Dr. Martin Luther King Jr.’s historic “I Have a Dream” speech. 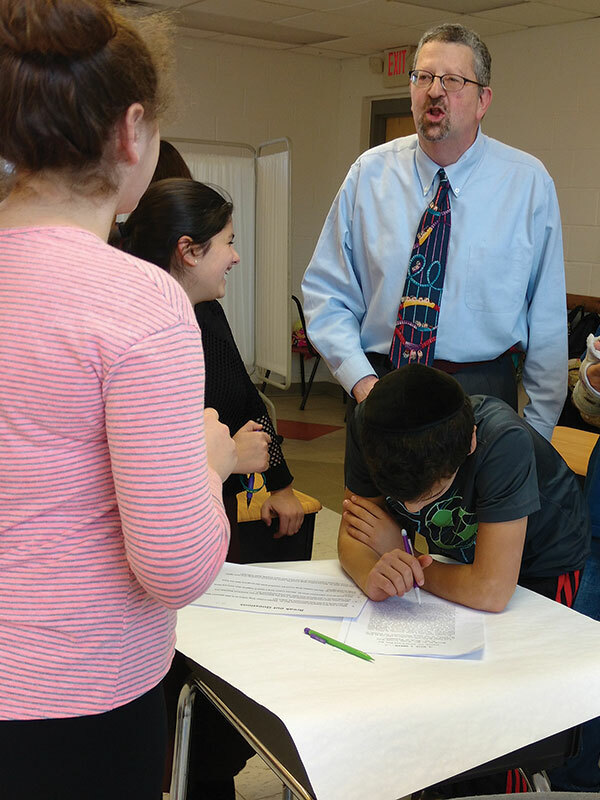 On Jan. 16, a day when most public school children were off in observance of Martin Luther King Jr. Day, students at Yeshiva at the Jersey Shore in Deal were studying the Civil Rights movement and the life of the man whom the national holiday honors. Third- and fourth-graders watched Our Friend, Martin, the award-winning animated film about King and his leadership of the American Civil Rights movement. The students discussed what America was like before and after the activism of the late ’50s and ’60s. Sixth-, seventh-, and eighth-graders took part in discussions after viewing a video of the stirring “I Have a Dream” speech King delivered in August 1963 at the Lincoln Memorial. 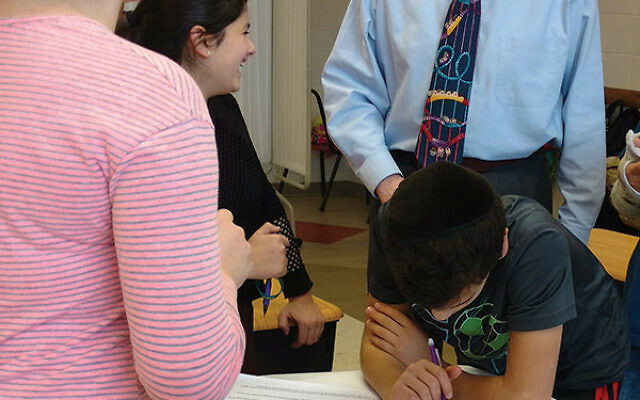 To personalize the lessons, students tied the struggles of African-Americans to achieve equality to Jewish tradition and law and learned of the role Jews played in the Civil Rights movement. Fourth-grade Jewish studies teacher Aliza Ross emphasized the Torah’s mandates to treat others with respect and kindness. Her message was not lost on the youngsters. First- and second-graders learned words relevant to the Civil Rights movement, such as racism and segregation; what life was like for African-Americans before the achievements of the movement; how peaceful protests helped change laws; and about King himself. Assistant principal for general studies Bonnie Drazen explained the evolution of race relations to third- and fourth-graders, all of them too young to remember when there was not a black president. While she taught that some terms that were used to refer to African-Americans decades ago, such as “colored,” are no longer acceptable as they once were. She used stronger language in reference to another term. “There is a word that begins with ‘N’ that is never okay,” said Drazen. Students questioned why King and other African-Americans didn’t leave the South to escape overt racism. She told the students in the older grades that many Jews who participated in the movement did so because, based on the long history of anti-Semitism, they could relate personally to the discrimination experienced by blacks. YJS director of advancement and communications Shai Goldstein, a former director of the New Jersey region of the Anti-Defamation League, outlined for the older students efforts to gain equal rights for African-Americans as guaranteed by the 14th Amendment — which addresses citizenship rights and equal protection under the laws — and the right to vote as guaranteed by the 15th Amendment. He tied these historic acts to the enactment of the Voting Rights Act signed by President Lyndon Johnson in 1965. Goldstein also talked about the Freedom Riders, who aided African-Americans in their efforts to secure their rights in the South in the ’60s.